Lord Nekron’s (Stephen Mendel) forces are advancing via glacier on King Jarol’s (Leo Gordon, The Intruder) volcanic realm. When Jarol refuses a truce, Nekron’s minions kidnap Jarol’s daughter Teegra (Maggie Roswell, Midnight Madness). Can Larn (William Ostrander, Christine), the lone survivor of a village destroyed by Nekron help Teegra escape and defeat Jarol, and just who is Darkwolf (Steve Sandor, The Ninth Configuration), the masked man who aids him? One night a couple of weeks ago, I check my Netflix queue at work, and I saw that the Baroness was watching Fire and Ice, the Ralph “Fritz the Cat” Bakshi/Frank “Every Other Cover of Dragon Magazine” Frazetta collaboration from the Barbarian film boom years of the early 80s. Years earlier Brother Grimm showed up at my parents house with a VHS copy of the film, but I wasn’t allowed to watch it for “reasons”, and I’ve since heard it was an entertaining, if not particularly special, barbarian film. Turned out that the Baroness only watched part of it, and I finally saw a film deemed too saucy for young Mortimer. Forget the Male Gaze, this flick skips right to a Leer. Fire and Ice is what you’d expect from a pairing of Bakshi and Frazetta. 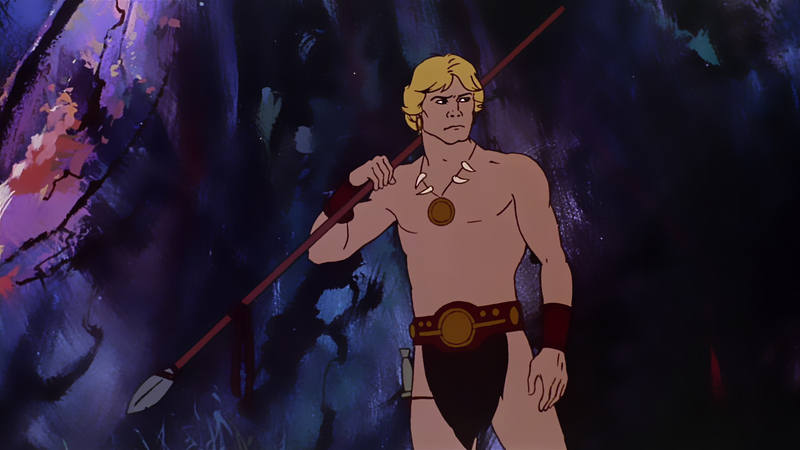 From Bakshi we get the usual reliance on rotoscoping, though it looks better here than in his legendarily botched version of The Lord of the Rings, and at times gives the characters a sense of movement more realistic than most animated films achieve. The cost cutting measures, such as repeated use of the glacier scenes, also seem to be a Bakshi trademark (though how much of that is due to the budgets he worked with I can’t say). 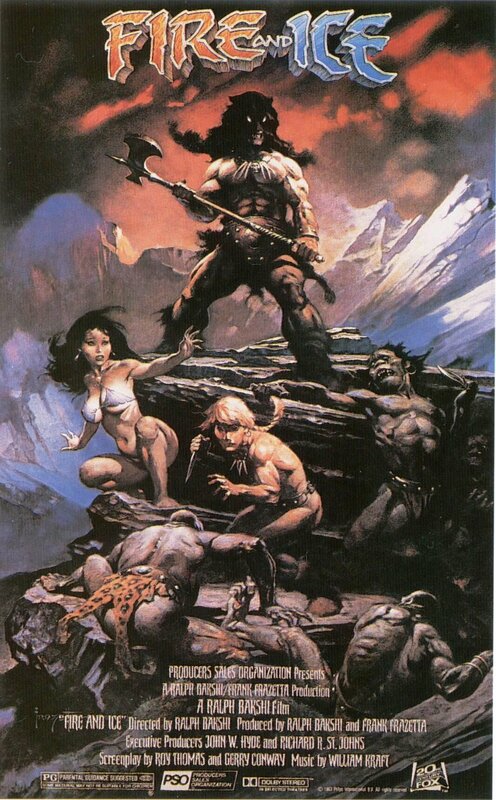 Frazetta brings his legions of women who “pack much back”, as the sage Sir Mix-A-Lot would say, into tiny thongs and muscle-bound men in loin cloths, even while living in arctic wastes. Apparently Darkwolf, the masked man who we dubbed “Batman”, is a regular Frazetta character. Fire and Ice has a more intense male gaze (shall we just call it a leer?) than most films, but whether we should blame that on just one of the creators is difficult to say. The story is pretty typical barbarian movie stuff, and generally entertaining if you don’t mind a little cheese in your films. This entry was posted in Animation, Fantasy, Independent, Quick Reviews, Reviews, Sword and Sorcery and tagged barbarians, cash-in, dinosaurs, father, father-daughter relationship, Frank Frazetta, glacier, Maggie Roswell, masked avenger, mother, mother-son relationship, overbearing mother, Ralph Bakshi, rip-off, rotoscoping, sorcerer, volcano. how do I not know about this film? It seems thoroughly wonderful and dreadful at the same time. Does it have an audio commentary worthy of Conan the Barbarian? I don’t think it was widely released. As to the commentary track, if there is one it must be nuts-I streamed it from Netflix so I can’t say.